What Happens When “Happy” Goes Minor? Major is happy, minor is sad. It’s the one music theory thing that everybody knows. But what happens when you cross the streams, taking a major song and throwing it into the soul-crushing abyss of a minor key? 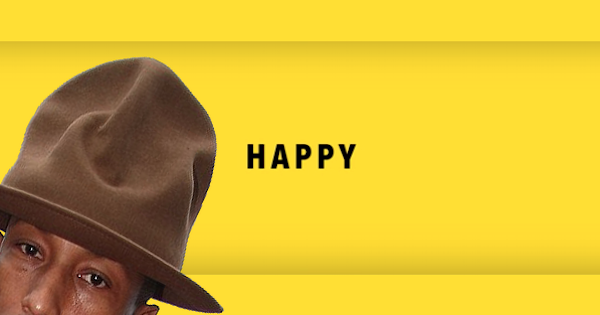 But there’s one pretty obvious target that Chase hasn’t transmogrified yet — a song so happy that its actual name is “Happy.” So I wonder what happens if you take Pharrell Williams’s infectiously danceable hit and put it in a minor key? I’ll tell you what happens. NOTHING happens — because “Happy” is already in minor. Now there is a little major cream in the minor coffee of this song, a few A-naturals peeking through here and there. It’s a common practice in jazz and R&B to let major and minor knock up against each other. But there’s no doubt that minor wears the pants in this one. If I scrubbed every little fleck of major from “Happy,” turning it all minor, you’d hardly notice the difference. Turn it all major, though, and the song is destroyed. Gah. It’s like the Partridge Family at its whitest. Okay, so “Happy” is minor. But how can that be? How can anything as happy as “Happy” be in a minor key? The answer is that emotion in music isn’t on a simple major/minor toggle. A lot of variables are in play. In his remixes, Holfelder never only changes the mode to minor — he messes with tempo, instrumentation, dynamics, vocal stylings, and chord structures as well. And aside from sad, a minor key can be powerful, goofy, thrilling…and yes, even happy.